Welcome everyone to my second installment of Clay’s Corner. I obviously do not have a theme as you may see on many other blog sites. Maybe, in time, I’ll come up with a theme and stick to it. However, in the event I never come up with a theme, I guess my theme will be “Theme-less”. Before I begin, I must warn you that this will probably be a long one. Grab some a cup of coffee or tea, prop your feet up and enjoy. I do appreciate the comments I received from my first post. I am also humbled that you would take the time to read this. I hope you enjoy it. God Bless. The background scripture for this installment is Ephesians 1:16-23. Please take a moment to read it. This is a powerful letter Paul wrote to the people in Ephesus. However, I’m not going to make this scripture my main focal point on prayer. In Ephesians 6:18, Paul says to “pray at all times”. 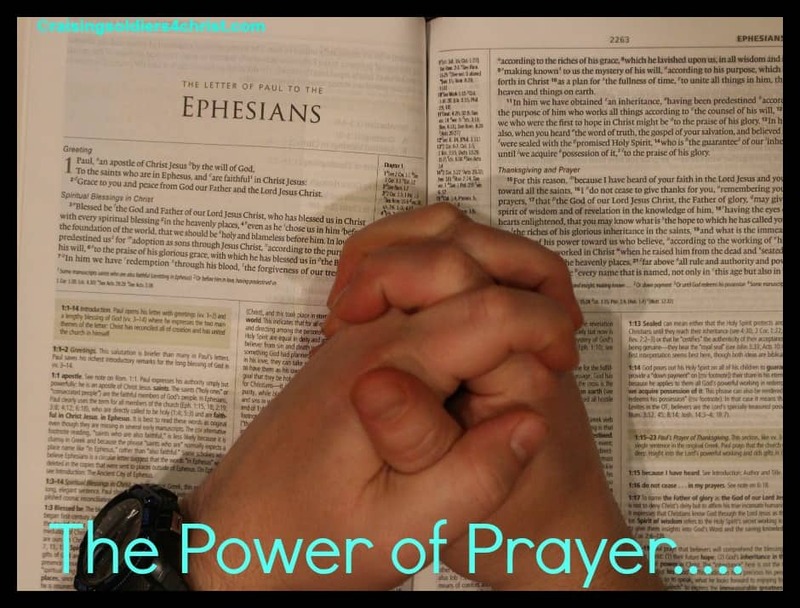 Ephesians 6:18-20, Paul offers instruction on prayer and explains when, how, and for whom to pray. Prayer is the main weapon of spiritual warfare. In 1 Thessalonians, Paul says to “pray without ceasing” (5:17). In 5:18, Paul goes on to say to give thanks in all circumstances; for this is the will of God in Christ Jesus for you. Let’s think about that for a moment…..give thanks in all circumstances. Nowhere does Paul say to only give thanks when God is blessing you with your wants and desires. Nowhere does Paul say to give thanks only when you have your cake and eating it too. No, Paul says to give thanks in all circumstances. This includes the valleys. This even includes the valleys that Job traveled through. And through steadfast prayer, confession and repentance, God restored Job. There are roughly about 650 different prayers in the Bible. Prayer is communion and communication; prayer is the effort of man to reach God to have an audience with the Father; prayer is the breathing process of a Christian’s soul. The best way to fight sin is on your knees, praying to God. When praying, we don’t get God’s attention with flowery words, but with a humble and contrite heart. There are different types of prayer. These are the acts of prayer. A.C.T.S. A – Adoration & Praise (2 Cor 9:15; Ps 89:7-9; Ps 99:1-5; Ps 111:9; Lk 2:14; Rev 4:8, 11). C – Confession (1 Jn 1:9). 1. Isaiah 6:1-5 says that you can not enter into the presence of God in prayer without confessing. Confessing is not a bad thing. Two great men in the Bible who confessed their sins….Daniel and Nehemiah. 2. God won’t answer prayers when there is sin in our lives. (Ps 139:23-24; Ps 66:18; Prov 28:9, 13; Isaiah 59:1). 1. Adoration is for what God is; Thanksgiving is for what God has done. 2. Some other passages are Isaiah 25:1; 1 Thess 5:17-18; Colossians 4:2; Eph 5:20. 6. But also supplication as an intercession for others, like how Christ intercedes for us, and as the Holy Spirit intercedes for us as we pray. Who do we pray for? We pray for lost; we pray for our rulers (those in power); we pray for the sick; we pray for our enemies; we pray for Christians; we pray for proclaimers of the Gospel. In John 17, Jesus’ example who to pray for is pray for self, pray for the saved, and pray for the lost. 13. Be specific. You don’t go to a restaurant and say, “I want food”. No! You’re specific. You order a steak, medium rare, mashed taters, etc. Your prayers should be the same. I’ve heard the arguments of prayer posture. However, there are 5 postures recorded in the Bible: Fell on face, lifting up hands, kneeling down, standing and sitting. Regardless of your preferred posture, pray. I do know that God’s response will come in response to our prayers. – It may be a Yes. A speedy reply. God knows what we need. – It may be a Wait. Sometimes we are not able to receive what we ask of God. He knows that we are not ready. – It might be Something else. Like a baby that cries for something, but don’t know what it is. The disciples asked Jesus for one thing. They didn’t ask Him to make them great preachers or eloquent speakers. They asked Him to teach them to pray. Jesus taught them the Lord’s Prayer in Matt 6:9-13. 2. Choose a posture that will keep you alert. 3. Set aside some time each day like Daniel did. 4. Use cue cards if you have to. 5. Use a prayer list. 6. Get away from distractions. Finally, something that I am guilty of – husbands praying with wives. If you were to ask me to pray in front of 20 thousand people, I would happily oblige. I’m comfortable praying with my children, with friends, and even with strangers. I’m not the most disciplined about it, but I love to pray. Why is it that I will accept almost any excuse not to pray with my wife? I love my wife dearly and am well pleased with her, our marriage, our life together. I have a few guesses why it’s so difficult to pray with our wives. 1. They know us too well to buy our press. Twenty thousand (20,000) men gathered together aren’t quite so intimately aware of my shortcomings. Maybe I feel like a hypocrite when I talk to God with her. However, this actually creates a great benefit, doesn’t it? If I feel like a hypocrite, then the opportunities for true intimacy should be apparent. 2. It probably has 10 times the impact in the spiritual realm that praying with 20,000 strangers does, so Satan is probably much more motivated to dissuade me from praying with my wife. Only God and the angels know the impact of hundreds of small prayers over the decades; but, I know that praying with her certainly has 10 times more impact on my daily spiritual life much more than praying with a crowd. 3. We hate feeling foolish, especially with the woman we promised to cherish, love and honor. Many of us feel like we need to be clever, creative and eloquent with our words. Others of us have some idea that only paid professional Christians, like priests, pastors and cult leaders are supposed to pray out loud, and in King James English too. These all are insecurity based lies… and really just excuses. 4. Many of us aren’t sure what to do or what to say. However, I’ve learned that not knowing is more times an excuse than it is reality. There is a difference between not knowing and not doing. I’m guilty of not doing as much as I should. Matthew 18:20 says “For where two or three are gathered in my name, there am I among them.” Allow God to be among you. In time, the prayers with your wife will have an impact on your marriage and on my marriage. On a side note. Ladies, sometimes your husband just needs a little help. He needs a kick-start of sorts. Sometimes it takes you to begin the prayer. Yes, before you say anything, I know your husband is the spiritual leader of the house and the responsibility rests squarely upon his shoulders. Look at your husband and ask yourself, “Is he comfortable praying in front of strangers? Praying in front of church leaders? Praying with his children?” If any of those questions are yes, then ask yourself, “Why isn’t he comfortable praying with me?” Crazy question, right? Well, allow me to elaborate with my personal beliefs on this matter. 1. Praying in front of strangers. Strangers don’t know me. It’s too easy for me to pray for them and with them. It’s also a possibility that I’ll probably never see them again. 2. Praying in front of church leaders. Aren’t I supposed to do that? Don’t I want leaders in my church to know that my family is “squared away”? I am the spiritual leader. I am supposed to pray in front of and for my Pastor, my Deacons, the sick, the tired, the financially unstable, the lost, the missionaries, etc. Don’t take it the wrong way though. It’s not a facade. My prayers are sincere. I am the spiritual leader in my home. I read scriptures everyday. I pray everyday. 3. Praying with my children. My children think I hung the moon. I can do no wrong in their eyes. They need toys put together – Daddy. They need batteries – Daddy. They want to ride their bikes – Daddy. They need help with building a LEGO structure – Daddy. They want to wrestle – Daddy. They’re scared at night – Daddy. Daddy is the know all and end all. Daddy is strong. Daddy defeats the boogeyman. Daddy makes the best pancakes. Daddy loves his children. Why wouldn’t Daddy pray with his children? 4. Why not pray with my wife? Tough question. I wish I had the answer. I’ve prayed with my wife a few times. However, it’s not enough. I know it and she knows it. I try to do better, but it seldom ever happens. So why not? My wife knows me intimately. She knows my faults. She knows my shortcomings. I love my wife more than I could ever put into words. I know this. She knows this. God knows this. All I can tell you, ladies and gentlemen, is that praying with your wife is one of the most intimate things you will ever do. Prayer tears down those walls and makes us, as men, feel vulnerable. Isn’t that what God wants, though? He wants us vulnerable. He wants us yearning for Him. He wants us to lead our families and love our wives as Christ loves the church! Please excuse me. It’s time for me to pray with my wife. Wow!! Good Job!!! I really enjoyed this study. In fact, I’m going to keep this & with your permission I may use it (or a part of it) from time to time when given the opportunity to teach or preach. Thank yopu for the time you have devoted to do such a good job with your blog!! Enjoyed your comments on Prayer Clay that must have taken a lot of time to research, keep up that good work.